I have been playing the violin since the age of 3. I was classically trained at the University of Manchester. 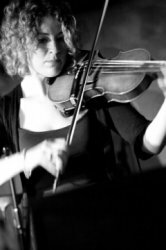 I currently play in orchestras and bands, and regularly record as a session musician. I have been giving violin lessons for two years and am now in a position to build up my clientele. I teach any age and level, and always adapt my lessons to suit the individual, with a big emphasis on making lessons fun! I will teach whatever style you would like, whether your aim is to play a Mozart violin concerto or join a band. I can teach following the ABRSM examination syllabus if required, or just for fun. The choice is yours. I can incorporate learning to sight read into your lessons too. Please email or call me to ask any questions and arrange your first lesson!